My dad has been the inspiration for many of the stories I write, and today's post is no exception. Born on the brink of the Depression into a farming family in Oklahoma, my dad's a spinner of yarns, Uncle Mike or Grandpa Mike to a bevy of kids/adults, a horse trader of some renown, a Korean War veteran, and a man I'm proud to call Dad. Oh yes, he's also the "buggy man" - not to be confused with the "boogie man" - and a restorer of antique buggies. Daddy has had a lifelong fascination with buggies and once was the proud owner of an authentic Amish buggy that he bought in Kansas. When he picked up his youngest grandson from pre-school in the buggy, he earned the "coolest Grandpa in the county" status. After he retired, he began taking old buggies and restoring them and has done a couple of dozen since then. He goes to auctions where he buys them in various states of disrepair, but the primary thing he looks for is solid hardware. He then replaces all the worn out wood, including the seat box and has the new box (and top if the buggy had one) recovered by an Amish buggy maker that he knows. No, we're not Amish, but I think my dad could have lived quite happily in the 19th century. He replaces spokes and repairs the wheels for whatever needs done, puts on fresh paint and polishes up the hardware. It can take him anywhere from a couple of months to an entire winter to finish one buggy. It's meticulous work that he sees in his mind's eye and tries to keep each detail as authentic as possible. If there are any identifying plates, he keeps them intact. He then sells the restored buggy or trades it for horses or mules (his other passion). It's an avocation that's kept him busy in his senior years as he works tediously in the shop down the hill from his rural home. 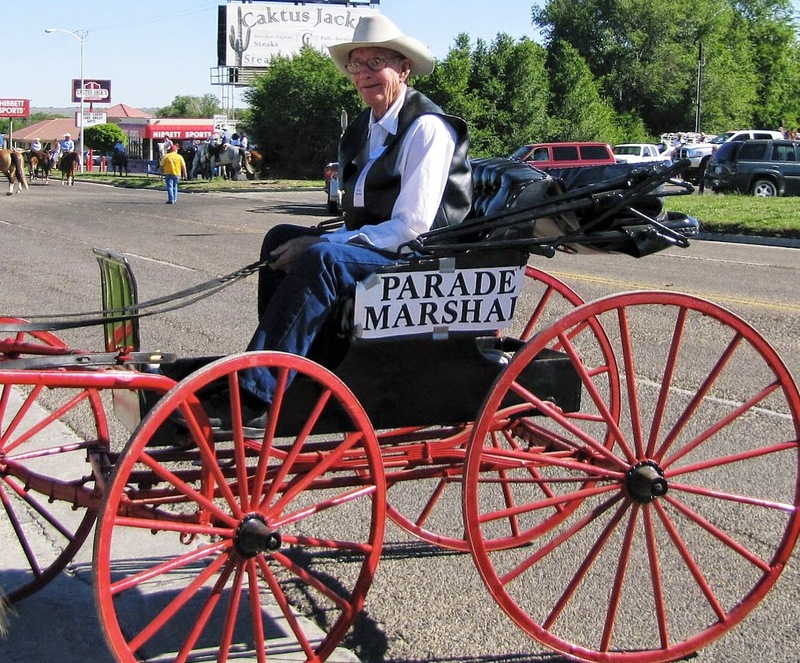 In 2010, Daddy was chosen to be the Parade Marshal for the Pioneer Days parade in Guymon, OK. Traditionally, the parade marshal rides in the back of a convertible, but never one to do anything "by the book" Daddy led the parade in one of his restored buggies. It was a proud moment for him and all of us. Knowing that he likes buggies, I always look for them when I haunt museums as I do research for my novels. I then show the pics to my dad which garners some great conversation. Here are some I found at the Kentucky Horse Farm museum a couple of years ago. General Store on Wheels - Before the turn of the century, peddler's wagons like this one from about 1890 were a welcome sight for isolated rural Americans. I'm amazed by the variety and the plush detail of many of the buggies. They weren't just utilitarian but status symbols of the day. And anytime I visit my dad and admire his latest work in progress, I always learn something new. For instance, did you know Studebaker made buggies before they made cars? How about you? Does anyone in your family have an unusual hobby? Have you ever ridden in a buggy? Would you have liked to live in a different time when we traveled in horse-drawn carriages? I'm pretty sure my dad would have fit right in. Carla, what a thrill it must be for your father to work on a buggy restoration and for you to see the finished product. I'm guessing you inherited your love of history from him. Which of his buggy restorations has meant the most to him, and why? Yes, Keli, growing up in our house gave the world a different perspective - oh, the stories I could tell . . . Daddy was really partial to the buggy he rode in for the parade and plans to keep it. Most of them have gone on to new owners and new lives. What a great question - thanks! Carla, what a great hobby your dad has! I just recently learned the difference between a hack and a stage coach. So much to know about these modes of transportation! Thanks, Karla - yes, so many different modes and it changed almost by the decade - almost as quickly as fashions in the late 1800s and early 1900s. So what does your story have - a hack or a stage coach? Your dad sounds great! My in-laws have an old sleigh in their barn that they picked up years ago. I love old buggies and took a ride in an Amish one once in Lancaster. Carl, thank you for introducing us to your father. What a neat hobby. I wish I could have seen him leading that parade. I once took a buggy ride in Nevada City, but that's about it. Fascinating hobby. What a wealth of knowledge your dad has. I'm very thankful for people like him who care about the past and will take the time and make the effort to help maintain and preserve it! We connect Studebaker and John Deere with motorized vehicles, but both those companies started back in horse and buggy days. Quite the staying power in the business world! Thanks for those photos of buggies, too. It helps to know what a character might take to town, eh? What an interesting article. Thanks for sharing with us! I think that's really cool that your dad is so into buggies! My grandfather was born in Kansas and lived in Nebraska before the Depression. His grandfather was Amish but left the church and went on to fight in the Civil War in the Indiana Cavalry. I'd love to learn more about my grandfather's life and his parents' experiences out west.